The vertical drop from summit to base is 4121 ft. The average difference in altitude between base and summit of Ski Resorts in Austria is 2392 ft. Most runs are therefore relatively long. 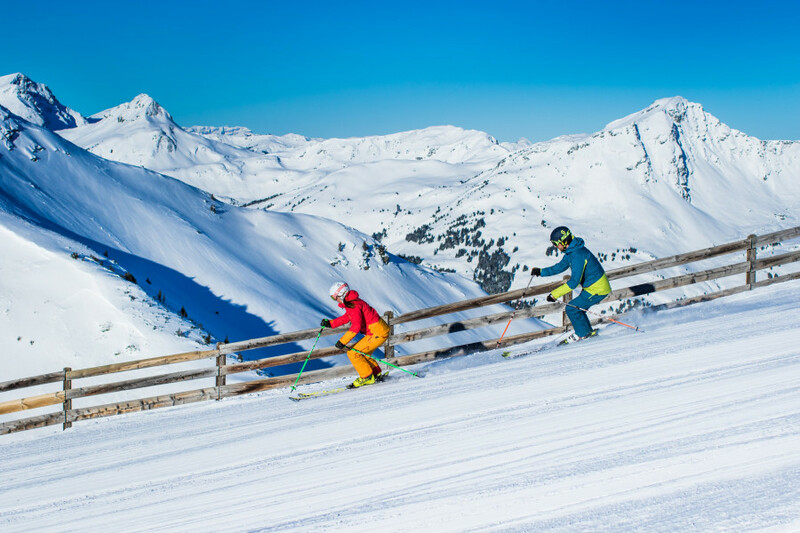 The high point of the ski resort is located at an elevation of 6877 ft.
Saalbach Hinterglemm Leogang Fieberbrunn is among the 5 best rated Ski Resorts in Austria. It is among the 10 most family-friendly ski Resorts in Salzburg. Season starts on Nov 30 and ends on Apr 22 (143 days). Average season duration in Austria is 114 days. Average snow depth during the season (Nov 30 to Apr 22) is 39 " at summit elevation and 22 " at base elevation. Snow coverage is usually best during February, offering an average snow depth of 46 " at summit elevation and 30 " at the base. 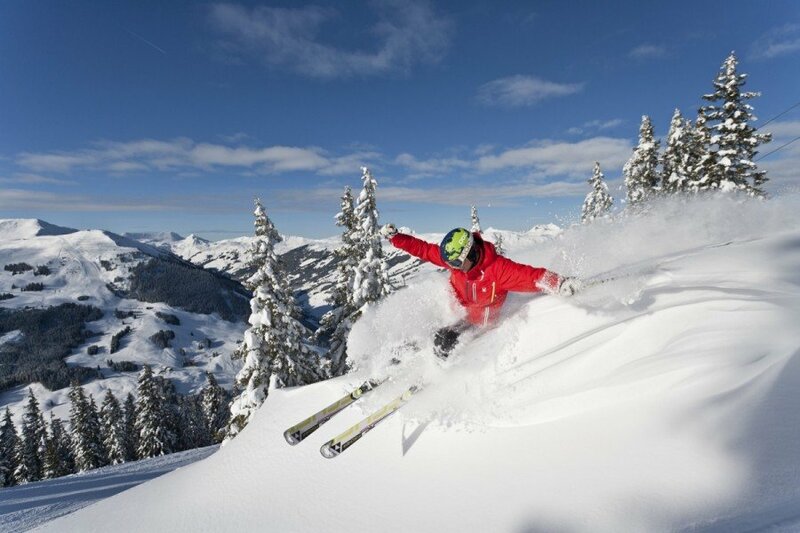 Therefore Saalbach Hinterglemm Leogang Fieberbrunn is among the 10 ski Resorts with best snow conditions in Salzburg. 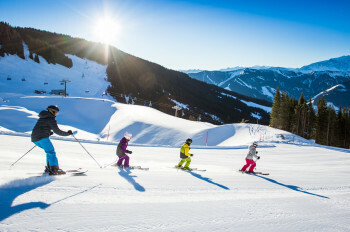 Saalbach Hinterglemm Leogang Fieberbrunn features 62 sunny days on average per season. The average for all ski Resorts in Austria is 63 sunny days. February is the sunniest month with an average of 20 sunny days. 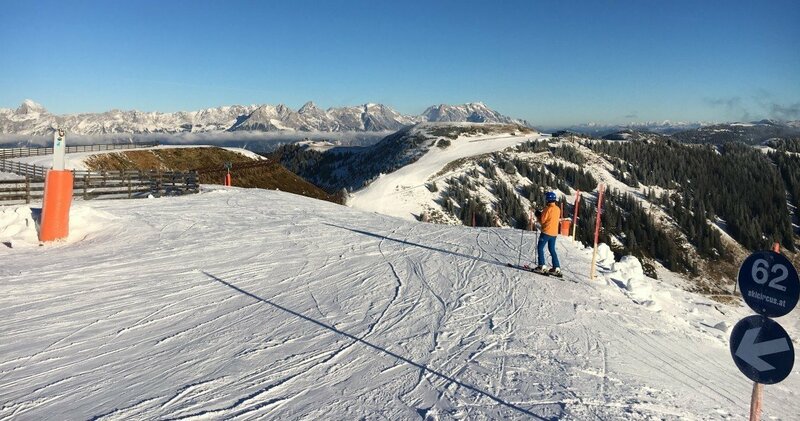 Offering 168 miles of slopes and terrain, Saalbach Hinterglemm Leogang Fieberbrunn is among the 5 largest Ski Resorts in Austria. The Skicircus Saalbach Hinterglemm Leogang Fieberbrunn is one of the best ski resorts in Salzburg State and is situated in the Kitzbühel Alps. The resort is really spacious and spreads out over the villages of Saalbach, Hinterglemm, Leogang and Fieberbrunn. This creates a large and diverse network of slopes, which provides 270 kilometers (168 mi) of skiable terrain. The resort is one of the largest in all of Austria and the entire Alps. There is something for everyone here: little newcomers, cool terrain park enthusiasts or ambitious piste daredevils. Good news for beginners: there are about 140 kilometers (87 mi) of blue marked slopes. These are spread out over the whole area. Even though you're only starting out as a beginner, you get to discover the entire ski resort on blue slopes. If your skiing or snowboarding for the first time, check out the slopes in the village of Hinterglemm. Conditions for beginners are superb because of the many short practice lifts. In addition, all newcomers should have a go at the slopes at the mountain “Pründlkopf” (1879 m/6164 ft). Advanced skiers have an almost endless amount of slopes to choose from. The ski resort operators came up with five different route recommendations, which are perfect if you want to see the most of the resort in a short amount of time. On the Skicircus circuit trail for example, you'll be able to circle the entire resort in just one day. Information regarding the different routes are available at the ticket offices and can be requested from the tourism association. 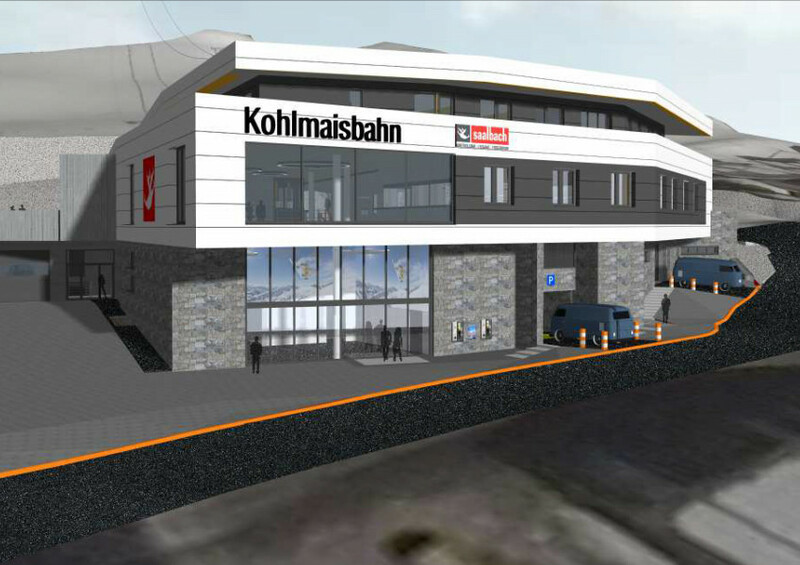 Another highlight is the permanent racing track at the summit “Schattberg West”. Here you will also find the gondola “Unterschwarzachlift”, which takes you up the mountain from Monday to Saturday until 9:30 PM for skiing under floodlights. At the gondola “Unterschwarzachlift” in Hinterglemm and at the lift “Almbahn” in Leogang you'll find a SkiMovie track. If black marked slopes are your calling, try the slopes at the mountain “Schattenberg”, “Zwölferkogel” and in the area of Hochalm. Slope No. 15 at the mountain “Zwölferkogel” is known for being a world cup slope and a true challenge for striving skiers. 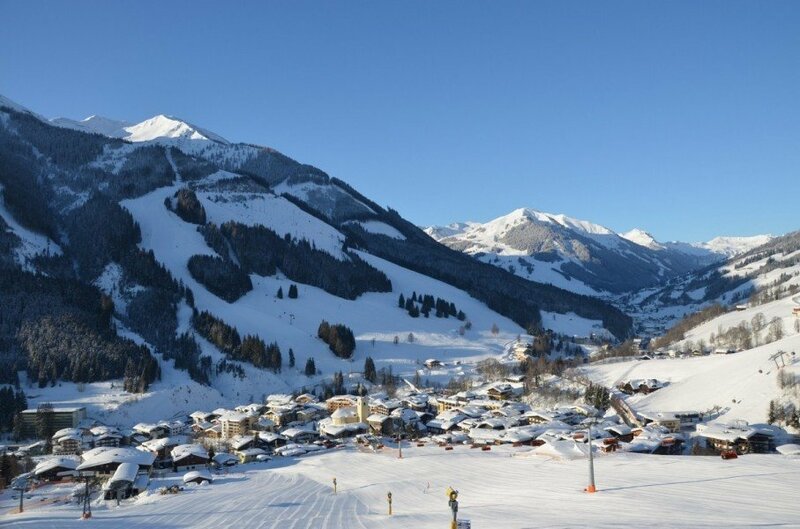 Two other black marked slopes can be found in the villages Leogang and Fieberbrunn. Freeriders and freestyle skiers and snowboarders are spoilt for choice at this resort, because there are not only five terrain parks but also freeride parks available. Terrain parks: NIGHTPARK at the lift “Unterschwarzachbahn” (floodlights), NITRO terrain park at the lift “Asitzmuldenbahn”, Learn-to-Ride Park at the gondola “Bernkogelbahn”, Easy Park at the t-bar lift “Zillstadt” and Funcross at the 6-seaterchair lift “Hochalm”. The freeride parks at the mountain “Lärchfilzkogel” in Fieberbrunn and at the lift “Asitzmuldenbahn” in Leogang are a combination of a terrain park and freeride track with different obstacles. The huge variety of slopes at the resort Saalbach Hinterglemm Leogang Fieberbrunn is continued when it comes to the selection of mountain huts. 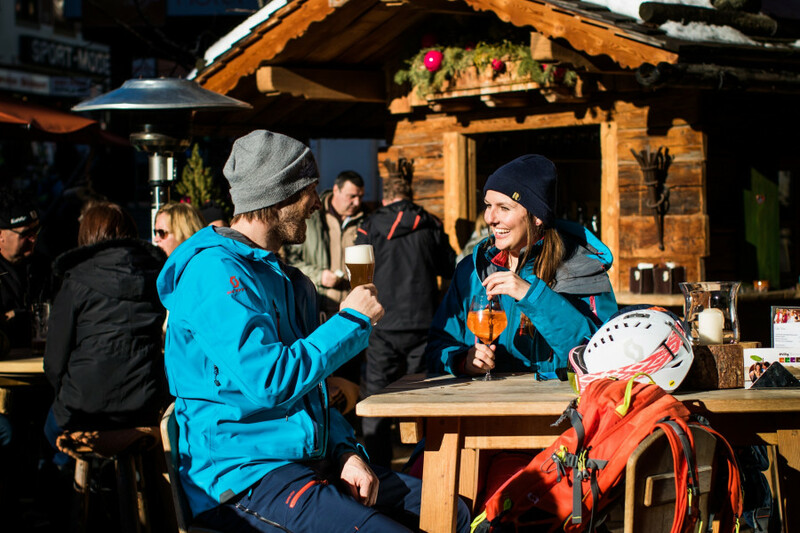 There are more than 60 huts inviting guests to strengthen themselves after a long day on the slopes, still their thirst with a nice, cool beverage or simply enjoy the sun and the magnificent views on the terraces. At the so-called “12er-Treff” (meeting point 12) at the mountain “Zwölferkogel” you can start your Après Ski celebrations at the umbrella bar, right after grabbing a bite to eat at the restaurant. At the mountain pasture Breitfußalm, also located at the mountain “Zwölferkogel”, you'll find a much more calm and relaxed atmosphere. A popular meeting point at the summit “Westgipfel” is the hut Gerstreit Alm, where unwinding on the sun terrace is a must! The highest situated mountain cabin in the resort is the so-called Westgipfelhütte at the summit “Schattberg West”. From there you have a stunning view onto the High Tauern and the Kaiser Mountains. In Fieberbrunn there is a restaurant called Ferchlstadl which has a truly rustic and quaint atmosphere to offer its guest. In this restaurant you either hang out at the cozy tiled stove, relax in the calm winter garden or enjoy some sun on the large terrace. The mountain hut Enzianhütte is also a popular place for eating and drinking at lunch time. Here, another terrace attracts sun worshipers. International as well as Tyrolean specialties are served at the restaurant Lärchfilzhochalm. Another highlight would be the heated sun terrace below a large umbrella. If your expectations of the Tyrolean cuisine are extraordinarily high, stop by the mountain hut Wildalpgatterl. Before noon you can enjoy a late breakfast and for lunch choose from always changing yet always fresh menus. In the evenings this restaurant is perfect for enjoying Glühwein and Kaiserschmarrn (shredded pancake). Families with children should go to the restaurant Streubödenalm. Aside from Tyrolean specialties you'll find an awesome children's play area with jumping cushion, alpine coaster and a forest rope course. Definitely try the slope “Schattbergabfahrt” and the run to the valley Leogang (7 km/4.3 mi). © Skicircus Saalbach Hinterglemm Leogang Fieberbrunn The toboggan tracks provide fun for the whole family! The Skicircus has lots to offer on the slopes as well as off-piste. At the summit “Reiterkogel”, at the hut Spielberghaus and at the restaurant Maisalm you'll find the Saalbach Hinterglemm toboggan tracks. 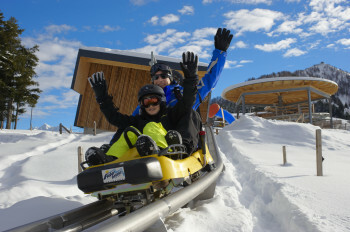 In addition, the Leogang valley has its own “Leo´s Kufengaudi”(Leo's tobogganing fun) and daily toboggan track close to the chair lift “Almbahn”. In Fieberbrunn you should check out Timoks Coaster for fast fun! For a little more peace and quiet, definitely look into the selection of winter hikes. Around the resort there are 22 winter hikes with different lengths, levels of difficulty and for everyone’s taste. A true highlight is the so-called “Baumzipfelweg”, leading through snowy forests and crossing the “Golden Gate Bridge of the Alps”. For the ones who crave adventure, Saalbach has just the thing to try: a permanent snowmobile course. And for even more action, check out the IceKart course in Saalbach. © Skicircus Saalbach Hinterglemm Leogang Fieberbrunn Après Ski fun is guaranteed here! Après Ski in Saalbach Hinterglemm is one of the best in the area of the Alps. 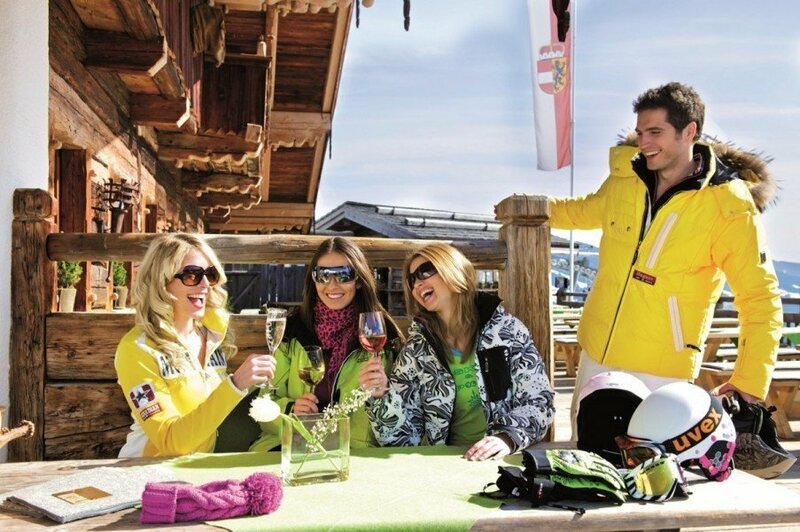 Alongside the slopes there are numerous umbrella bars and sun terraces to get the party started. Popular places include the “12er-Treff” (12 meeting point) at the summit Zwölferkogel, the Bigfoot Bar or the mountain hut Hinterhag-Alm at the slope “Maiskogelabfahrt”. When the lifts have closed, the fun continues down in the valley in one of the many Après Ski Bars. 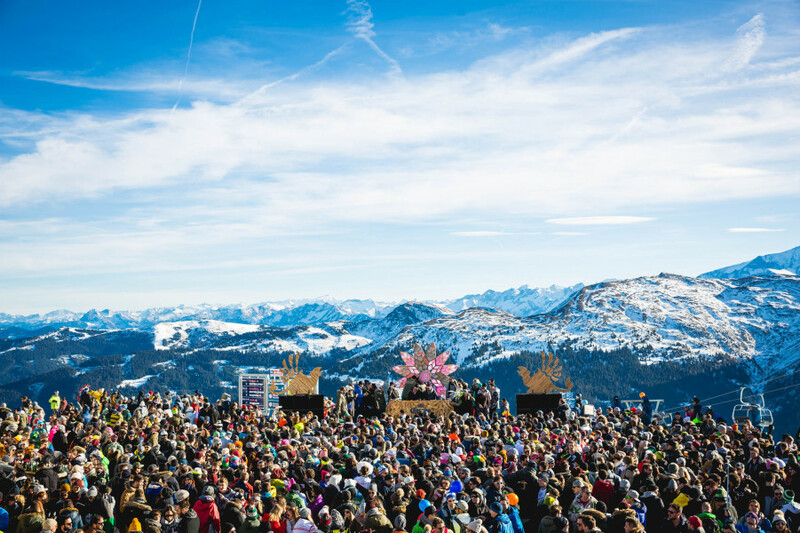 Trendy locations are for example the so-called Bauers Schi Alm in Saalbach, the bar Tanzhimmel in Hinterglemm or the Alibibar in the town square of Saalbach. In the village of Fieberbrunn the most famous meeting point is the Fontanastadl. The rustic hut is the right place for enjoying a delicious drink with good company. At the base station of the gondola “Streuböden-Gondelbahn”, another highlight awaits: the IGLU-Snow Bar. 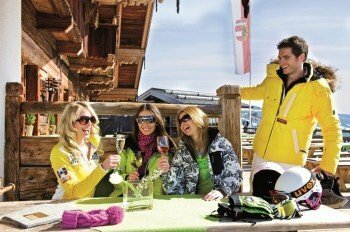 Après Ski fun is guaranteed here! In the restaurant Saalbacher Hof locals and visitors both feel welcome and comfortable. Main dishes are mostly traditional cuisine, such as Schlutzkrapfen/Mezzelune (semi-circular stuffed pasta), Tiroler Gröstl (Potatoes with beef or pork) or Hirschragout (deer stew). The restaurant called Zum Schwarzacher was tested by Gault Millau and awarded two toques. If you visit this restaurant, make sure you bring enough time for truly enjoying the fantastic dishes. The restaurant Herzlstube within the Hotel Kendler provides a rustic charm. While you taste the great food of the “Nouvelle Cuisine”(form of haute cuisine), keep in mind that this restaurant has also been awarded a toque by Gault Millau. At the Design Hotel Alpen-Karawanserai the restaurant Freiraum has it all: gourmet food with an excellent ambiance. For real gourmet fans, the trip to the municipality St. Jakob in Haus is definitely worth it. There you will find the famous restaurant Unterlechner. The team consisting of Manfred Rainer, Stefan Riepl, Sebastian Jöchl and head chef Andreas Unterlechner creates new and exciting dishes based on traditional Tyrolean and Mediterranean recipes. You can reach the resort from Germany with no vignette required. Take the highway A8 in the direction of Salzburg and take the exit at Siegsdorf. Continue in the direction of Inzell until you can exit in the direction of Lofer. Once you reach the village of Lofer, follow the signs leading to Zell am See until you reach the municipality of Maishofen. Here you will drive into the valley Glemmtal. After about 15 kilometers (9.3 mi) you should reach Saalbach Hinterglemm. The closest train station is in Zell am See. From there you can catch a coach bus to the resort. Airports near the resort are Munich, Salzburg and Innsbruck. The Holiday Shuttle of the resort makes sure all passengers get comfortably to their destination. Starting in Munich in the village Kiefersfelden at the border to Austria, drive onto the highway Inntalautobahn A12 and take the exit Kufstein Süd. Follow the road No. 173 until you can change onto the federal road B312 in the direction of Salzburg Lofer - St. Johann - Fieberbrunn. From Munich, the journey will take you about 90 minutes. Coming from the west, you will also take the highway Inntalautobahn A12, but this time take the exit Wörgl Ost. Passing through St. Johann in Tyrol you will reach the town of Fieberbrunn just by following the signs. does anyone know if there is is a snow park or how good it is?